Sign up and Save! Get a 5% Discount Voucher in your inbox after you sign up for our newsletter. Choose from our mascout,round or elegant gold pins. Fasten with a 1/4" post and clutch back. Lapel Pin Size: 7/8" x 7/8" or Slightly Smaller. .. Single Post 8" Trophy with Custom Engraving. 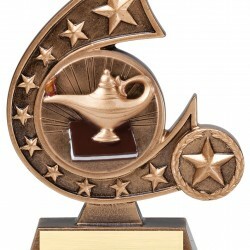 Trophies is also available in the color of your choice: BLUE, RED, GREEN, BLACK, GOLD, SILVER OR PURPLE This award includes a FREE engraved Gold-Tone Metal plate! You supply your text via an email or by above Text Boxes. 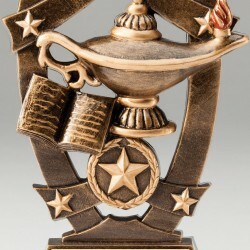 Up ..
Full Color Resin Academic Lamp of Knowledge 5" Trophy with Custom Engraving. This award includes a FREE engraved Gold-Tone Metal plate! You supply your text via an email or by above Text Boxes. 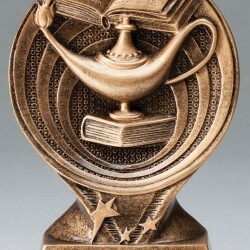 Up to three lines of text can be engraved on the plate, with up to 3..
Hand Painted Heavy Cast Resin Multi Color comet Series Academic Trophy.This multi-colored outstanding academic achievements Lamp of Knowledge Resin Award can be great for student!Size: 5.75" Tall. This award includes a FREE engraved Gold-Tone Metal plate! You supply your ..
Hand Painted Heavy Cast Resin Multi Color Saturn Series Academic Trophy.This multi-colored outstanding academic achievements Lamp of Knowledge Resin Award can be great for student!Size: 6" Tall. This award includes a FREE engraved Gold-Tone Metal plate! 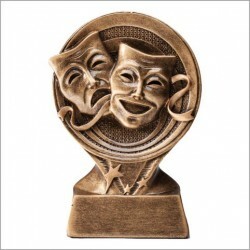 You supply your t..
Hand Painted Heavy Cast Resin Multi Color Saturn Series Drama Trophy.This multi-colored outstanding Acting Talent Resin Award can be great for student!Size: 6" Tall. This award includes a FREE engraved Gold-Tone Metal plate! 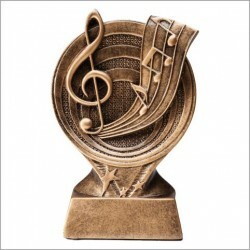 You supply your text via an email/upload..
Hand Painted Heavy Cast Resin Multi Color Saturn Series Music Trophy.This multi-colored outstanding Music Talent Resin Award can be great for student!Size: 6" Tall. This award includes a FREE engraved Gold-Tone Metal plate! 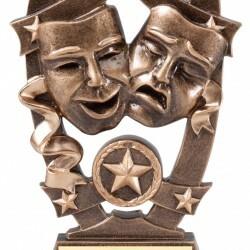 You supply your text via an email/upload ..
Hand Painted Heavy Cast Resin Multi Color Sport Star Series Drama Trophy.This multi-colored outstanding Acting Talent Resin Award can be great for student!Size: 6.25" Tall. This award includes a FREE engraved Gold-Tone Metal plate! You supply your text via an email/up..
Hand Painted Heavy Cast Resin Multi Color Sport Star Art Trophy.This multi-colored outstanding Art Talent Resin Award can be great for student!Size: 6.25" Tall. This award includes a FREE engraved Gold-Tone Metal plate! You supply your text via an email/upload file or..
Hand Painted Heavy Cast Resin Multi Color Sport Star Series Academic Trophy.This multi-colored outstanding academic achievements Lamp of Knowledge Resin Award can be great for student!Size: 6.25" Tall. This award includes a FREE engraved Gold-Tone Metal plate! 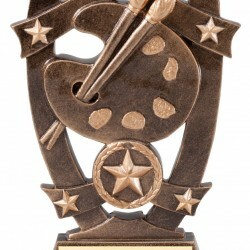 You supply your&nbs..
Hand Painted Heavy Cast Resin Multi Color Sport Star Series Music Trophy.This multi-colored outstanding achievements Music Resin Award can be great for student!Size: 6.25" Tall. This award includes a FREE engraved Gold-Tone Metal plate! 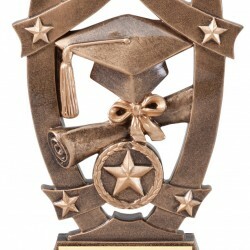 You supply your text via an ..
Hand Painted Heavy Cast Resin Multi Color Sport Star Series Graduate Trophy.This multi-colored outstanding academic achievements Graduate Resin Award can be great for student!Size: 6.25" Tall. This award includes a FREE engraved Gold-Tone Metal plate! You supply your text v.. Copyright © 2019, M&M Awards, All Rights Reserved.